PC Peter Grant is guarding a murder scene when a witness approaches him to say they witnessed the killing. Normally, the police are only too happy to have witnesses come forward, but in this case it is an event which is going to change Grant’s career, life and understanding of reality completely since the witness in question happens to be a 19th Century ghost. Grant’s encounter with the ghost soon comes to the attention of DCI Thomas Nightingale, the Metropolitan Police’s lead investigator of supernatural crimes and the last survivor of a centuries-old order of magicians found by Isaac Newton. Nightingale decides that Grant has a natural aptitude for magic and takes him on as an apprentice, teaching him magic as the same time as having him assist in the murder investigation which turns into an increasingly complex case as the number of victims increases. “Rivers of London” (which was retitled “Midnight Riot” in the US despite the fact that the riot in the book doesn’t take play at midnight) was a very enjoyable book. One of the blurbs on the cover tried to position it as a mixture of Harry Potter and a police procedural, but while I agree with the police part of the description, I think Tim Powers would probably be a more apt comparison than J.K. Rowling. 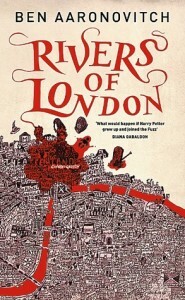 Like Powers' best novels, this had a detailed and evocative description of its setting written by an author obviously very familiar with London, and the supernatural elements of the plot were all tightly connected to the setting, particularly the River spirits that provide the title of the book, supernatural beings who embody various London waterways. The police aspects of the book were also written well, the protagonist is a very believable rookie police officer (the only slight criticism is that sometimes the police characters seem a bit too quick to accept the existence of magic). The story is told from Peter’s perspective and he is an entertaining narrator with a distinctively British sense of humour a number of witty and informative asides helping to add details about London and the eccentricities of police procedure. Peter’s narration is one of the main aspects that makes this book so much fun to read, even if it is occasionally slightly implausible when he goes off on a tangent about an obscure bit of London history in the middle of an otherwise tense scene. The plot moves along at a good pace and quickly becomes compelling. There is quite a lot of time spent on characterisation and establishing the setting and the supernatural elements of the story along with a fair amount of humour, but there are also times when the plot accelerates, particularly towards the climax of the story and there are a few surprisingly shocking moments of abrupt violence. Although this does have a complete storyline on its own, it is also very obviously the first book in what is presumably intended to be a long series and there are many aspects of the background that are only hinted at (such as Inspector Nightingale's history). A significant is spent on the titular Rivers of London, but although they do have some impact on the main plot it does feel as if the part of the plotline dealing with the river spirits has only just begun. I think one area where the sequels could maybe improve a bit is in the characterisation. Much of the time the characterisation is fairly good and Peter does get a decent amount of character development, but the supporting characters are interesting but sometimes a bit lacking in depth and only Grant and Nightingale really get fully developed as characters. In summary, this was a very entertaining book and an impressive start to a series.